This month we would like to congratulate the Driftwood Feeders 4-H Club for being awarded the Nebraska 4-H Club of the Month for July 2018. This club from McCook, Nebraska, in Red Willow county, has truly made a difference in its community. The club is dedicated to building strong citizenship and teamwork through various activities. The Driftwood Feeders 4-H Club members recently got busy with the paint brushes at the Red Willow County Fairgrounds. When the fair board was asked if they had a community service project for a 4-H’er, they replied that the 19 letter boards for the grandstand needed replaced. The fair board provided the materials and the 4-Her’s got busy painting. Because the boards were new, it involved priming both sides of the board before the letters could be painted on. The 4-Her’s can be proud at fair time that their efforts contributed to sprucing up the grandstand. 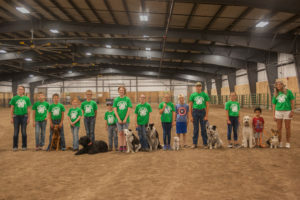 The Club also hosted the Dog Days in McCook show in June to provide the dog project members–ranging from Imperial to Kearney to Hastings–a chance to practice their show ring skills in a show format prior to the county and state fair shows. The money raised from the show will be used to purchase the agility equipment needed by the members. The club also provides agility equipment to the Nebraska State Fair 4-H dog show. Members plan on recording public service announcements at both local radio stations. These announcements will be used to promote the various 4-H shows, contests, and activities before and during the county fair. No Comments to "July 2018 Club of the Month"